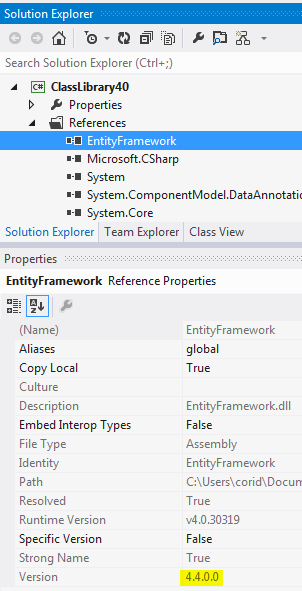 I was listening to a recent .NET Rocks with Julie Lerman on Entity Framework 5, and she was asked if EF5 worked with both .NET 4.5 and .NET 4.0. Around minute 26, she briefly mentioned it’s tricky because the dll that gets installed via NuGet is determined by the Target Framework the project is set to at the time you install EF via NuGet. I ran across an easy way to tell today & wanted to share, while elaborating on what she said with pretty pictures =D. NuGet writes a packages.config file in the root directory of every project a NuGet package has been installed in. Open it and you can quickly tell which version was targeted. When I changed the Target Framework of my 4.0 project to 4.5, THIS DID NOT CHANGE. The top one shows the App.config for the project I installed EF into that was set to target 4.5 when I installed the NuGet package. The bottom one shows the App.config for the project I installed EF into that was set to target 4.0 when I installed the NuGet package AFTER I changed the Target framework to 4.5. OK, but how can I upgrade my EF4.0 to EF4.4 on my existing projects? 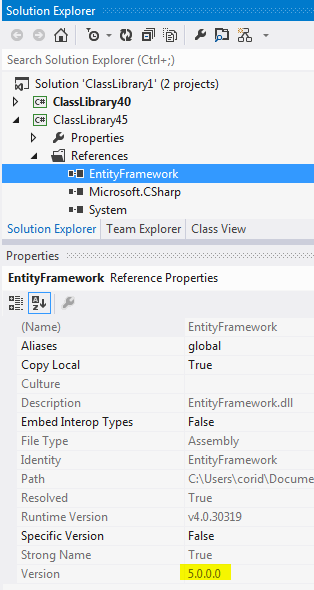 I’m adding the EntityFramework reference to my project, will it then use the newer one instead my old System.Data.Entity? You’ll need to re-download if you used NuGet to install it. 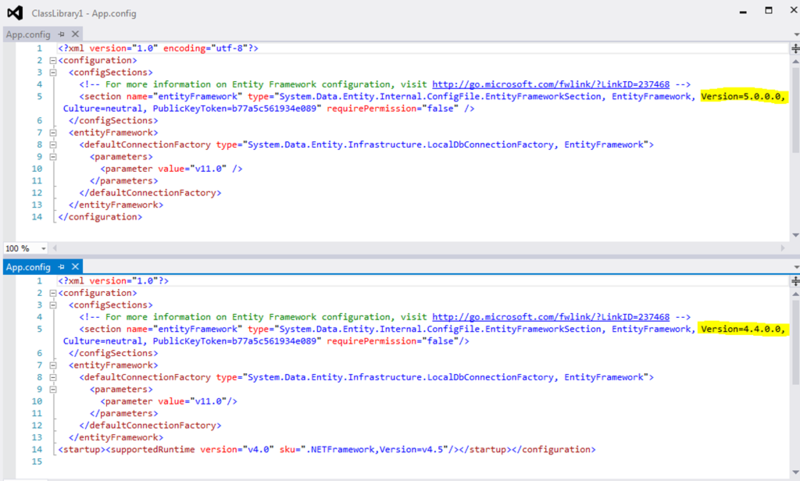 NuGet detects the project framework target at installation time & installs the dlls for that framework.